Independent University, Bangladesh (IUB) has been published a circular. IUB invites application from educated and interested candidates for the post of Research and Development Officer/ Bio-Lab Manager, Civil Supervisor, Department of Operations and Maintenance. Freight Forwarding Company is a finance and investment company in Bangladesh. Candidate should have qualification in MBA/ Masters with minimum working experience. 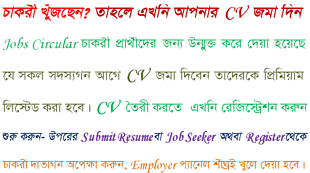 Job location is Dhaka. Amkodor polash industrial zone Limited has published a job circular. They currently look for dynamic, self motivated, competent for the following position Driver, Technician, Foreman, and Interpreter.